THE NORTHFACE BLACK JACKET! GIRLS 10-12 $99.00+ MUST SEE!! THE NORTHFACE BLACK JACKET! GIRLS 10-12 $99.00 MUST SEE!!. Condition is Pre-owned. Shipped with USPS Priority Mail. THE NORTHFACE FLEECE ZIPPERED HOODIE! GIRLS 10-12 $99.00+ MUST SEE!! The Northface Fleece Zippered Hoodie in Stylish Black/Magenta/Surf Green! Girls size large. Logo on left chest and back. The North Face Jacket Osolita Soft Fleece. Gray with Pink Trim. 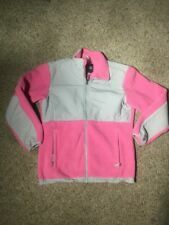 Used girls pink/gray north face Denali fleece jacket size XL. Good condition, clean, light normal wear. See photos. Pit to pit 21". Pit to cuff 19". Shoulder to bottom 26". THE NORTHFACE BLACK OSOLITA JACKET! GIRLS 10-12 $99.00+ MUST SEE!! The Northface Black Osolita Jacket! Soft & Warm! The Northface Black Soft Plush Jacket! Girls size xl. Logo on left chest and back. Pit to pit- 21". Each item we list is throughly examined for quality. Any imperfections will be stated in condition details. Condition: Jacket is in very good used condition. No major marks or imperfections to note. THE NORTH FACE girls' Oso hoodie jacket. Fixed hood. Binding on hood opening, cuffs and pockets. Embroidered logo on front and back. 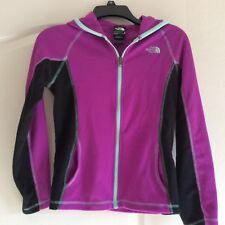 Up for sale is a North Face girls size 18 years purpleish blue pullover fleece jacket. The color is darker in the pictures than it actually is. Excellent used condition. Perfect for any girl. VERY GOOD USED CONDITION= An item that's been worn and in good shape that may have slight wear. The North Face Girls Youth Small 7/8 Denali Hoodie Jacket Black FAST SHIP! D3 New with Tags, First Quality FAST USA Shipper! Get a great deal! Thanks!. (Picture #7) It is not really noticable unless you know that its there. BIN: MIX Hanging toddler rack. And I will be sticking to it. Alway at a great low price. Zippered hand pockets and chest pocket; 3-panel hood; contrast stitching; thumbholes at cuffs. 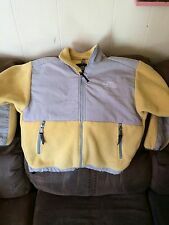 ​​Polyester microfleece is warm and static free, and it resists pilling in the wash. ​Used condition shows wear on the cuffs and several blue marks on the front. The North Face Kids fleece jacket. Girls size large. It is in very good condition with just a couple of spots. May have been part of a 3 in 1 jacket. See pic of cuff. Length down the back approx 24". Size: XL 18. The North Face. Length (Bottom of back collar to hem): 23. Sleeve length (Underarm seam to cuff): 19. Colors may be slightly different in person as lighting and computer screens can make colors look brighter or darker than they are. The North Face Girls Peach And Grey Gray Zip Up Fleece Hoodie SZ XS 6. Condition is Pre-owned. Shipped with USPS Priority Mail. Very cute fleece to keep you warm & cozy this year. Features full zip front, hand pockets, snap cuffs to use as liner, and elastic cuffs/waist. Make this the go to fall & winter jacket for your little outdoors girl. This is in excellent clean condition with no stains, flaws, fading, and minimal wear typical of fleece. Armpit to armpit is 21" across, shoulder to bottom hem is 21.5", shoulder to sleeve end is 19". Size girl's 18. This is is in excellent clean condition with no stains, flaws, fading, and just minimal wash wear typical of fleece. Armpit to armpit is 22" across, shoulder to bottom hem is 26", shoulder seam to sleeve end is 24". Try the "ZOOM" feature, it is a great way to take a closer look. The photos depict the actual item you will receive. I try to use a padded flat rate envelope for clothes as much as I can to save you money. THE NORTHFACE GLACIER FLEECE ZIPPERED HOODIE! GIRLS 10-12 $99.00+ MUST SEE!! The Northface Glacier Fleece Zippered Hoodie in Stylish Black/Magenta/Surf Green!